The museum is designed to be viewed as a massive cube floating over the landscape. Initially, the exterior was undetermined. Gate Precast’s Hillsboro, TX division worked with the design team to define the cladding through the creation of mockups with varying horizontal striations. The panel design incorporates both convex and concave horizontal striations. The random combinations lend striking shadows and the striations give way to smooth concrete surfaces on higher levels of the building. Gate’s BIM operators modeled over 100,000 square of precast cladding on museum's exterior which was integrated into the structure’s final 3-D model. 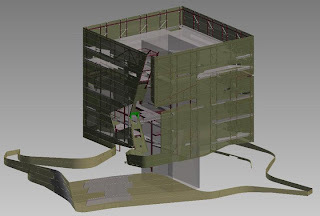 Company-wide, Gate has 38 trained BIM users and has modeled 2,000,000 square feet of architectural precast concrete. Contact Gate Precast for Design Assistance on Future Projects and Visualize Your Project Before It’s Built.